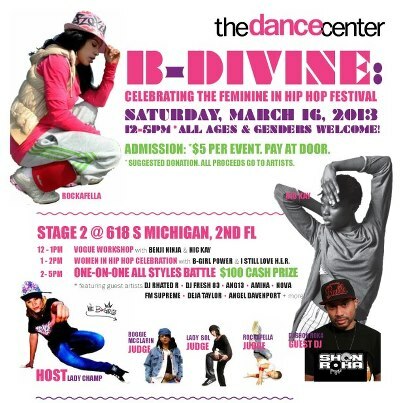 This past weekend, b-girls from all over the country and street dancers from around the Chicago area converged for B-Divine: Celebrating the Feminine in Hip Hop Fesitval. The gathering featured workshops, artists showcases, graffiti, and an all-styles battles, and focused on being a welcoming, supportive, feminist space, empowering movers, emcees and artists in an exploration of what femininity means to street dance, and how it connects multiple styles and dancers. The legendary Ana ‘Rokafella’ Garcia was in attendance and speaking truth, as were Leida ‘Lady Sol’ Villegas, Auristela ‘Lady Champ’ Nuñez, Boogie McClarin and a host of other pioneers of hip hop, house and street dance. Big shout outs to the entire event, its phenomenal organizers, and the conversations about history, intergeneration solidarity, queer power, and feminism in street dance it sparked. Mad love, and more of these in the future!